Every month I write about one of my favourite inspiring picture/children’s books from my bookshelves because they are so wonderful that I can’t help sharing. 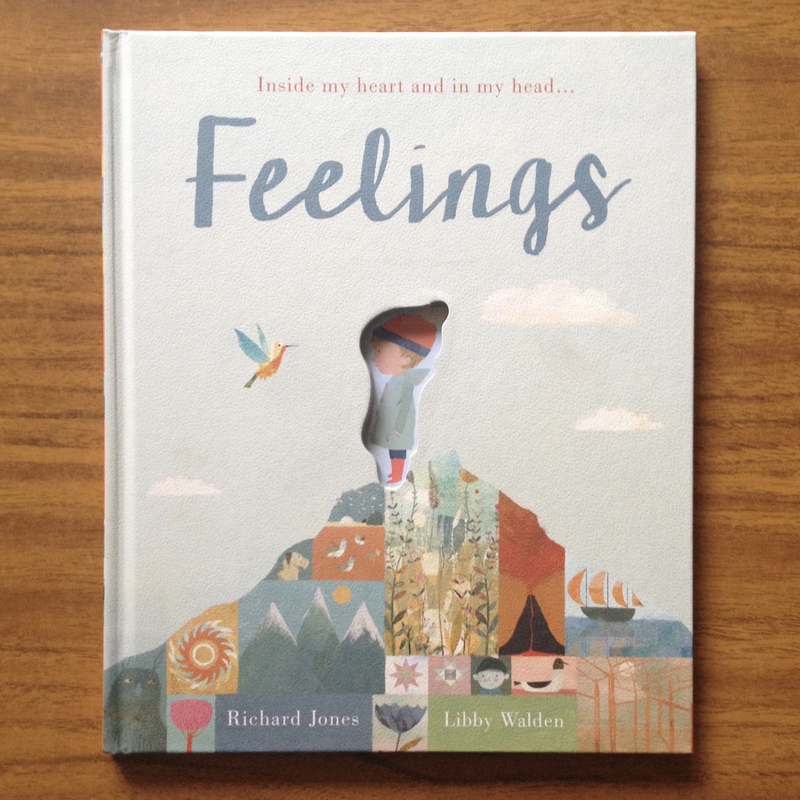 My pick for February 2017 is Feelings written by Libby Walden and illustrated by Richard Jones (Caterpillar Books 2016). You know it’s February, a month of love, when you see red hearts and roses everywhere you go. If you’re single, those cuddly teddy bears holding red hearts make you ‘ugh’. If you’re in a romantic relationship, you’re full of excitement, planning a candle-lit dinner. February air becomes thick with all sorts of emotions and feelings. Last week I went through my bookshelves, looking for a picture book about love to celebrate Valentine’s Day. My hands went strait to Guess How Much I Love You written by Sam McBratney and illustrated by Anita Jeram (Walker Books 2008), which I love right up to the moon and back (I have a copy but I’m so tempted to buy the 20th anniversary edition too). But I thought it’s too obvious. Then, I realised I didn’t have a picture book about love on my bookshelves. I do have lots of books about friendships, sibling and parental love, but not ‘romantic’ love. I wish I had a copy of となりのせきのますだくん (Tonari no seki no Masuda-kun), a Japanese picture book about a girl and her classmate who bullies her because he likes her. It would have made a perfect choice. Anyway, whatever my motivation was, I picked the boy as my future husband to be for a reason or two. I must have liked him enough to embarrass myself in front of my peers and teachers (or I was just desperate to wear a white dress). Sadly, I’m pretty sure it didn’t go down well otherwise why am I still single? So, at age of four, I must have gone through a whirlwind of emotions that romance can throw at you, and I’ve no idea how I dealt with it since I still struggle to comprehend my feelings sometime. Children are basically tiny humans who feel as much as big humans do, and trying to make sense of those strange sensations – sometime fuzzy, sometime prickly – bobbling up inside them could be overwhelming. Walden talks about the book in depth here. Richard Jones‘ gentle yet playful illustrations are perfect complement to the text, filling the gaps that the words can’t fully express. I’m a big fan of Jones. His illustrations are dynamic yet sensitive, colourful yet gentle. You can check out ‘behind the scene’ of this book on his website. By the way, my favourite spread in this book is ‘Jealousy’. What a lovely review Momoko – I’m so pleased you like the book! Jealousy is my favourite spread too, Richard come up with SUCH a great illustrative concept for that emotion. My pleasure! I really enjoyed reading about how the book came about on your blog as well as reading the book itself. What a beautiful book!